In Washington D.C., for example, traffic fatalities as a whole declined in 2018 compared to the year before, but the number of pedestrian and bicyclist deaths increased by 20 percent. Pedestrian deaths also have risen in New York, and pedestrian and cycling fatalities have increased in Los Angeles in the past several years. Across the nation, cyclist fatalities have increased by 25 percent since 2010 and pedestrian deaths have risen by a staggering 45 percent. 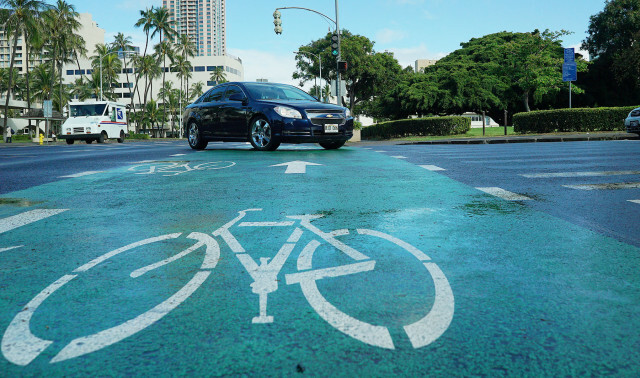 More people are being killed because cities are encouraging residents to walk and bike, but their roads are still dominated by fast-moving vehicular traffic. As my research has shown, this shifting mix can be deadly. 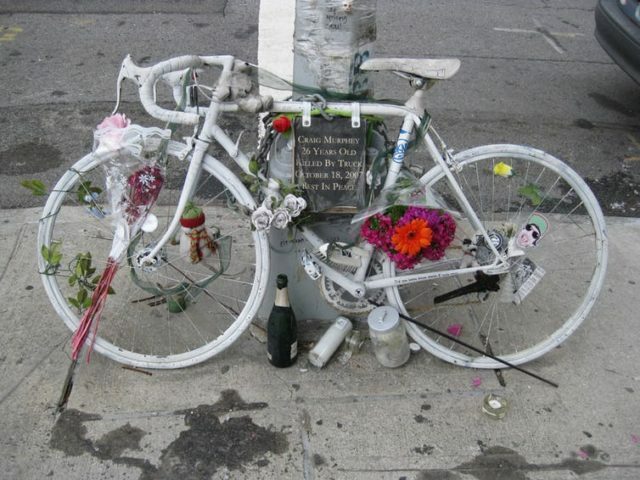 Cycling advocates set up ‘ghost bikes,’ like this one in Brooklyn, in memory of bikers killed in traffic. From a long-term perspective, traffic fatalities in the United States are declining. In the early 1970s, almost 55,000 Americans were killed in traffic accidents yearly, including people in vehicles, pedestrians and cyclists. By 2017 that figure had fallen to around 40,000, even with an increase in the number of vehicle miles driven. The overall decline is a confirmation of Smeed’s Law, named after R.J. Smeed, a scholar at the United Kingdom’s Road Research Laboratory. Smeed found that initially, with the early introduction of motor vehicles, traffic deaths tend to rise. Around the world, almost 1.35 million people die each year in traffic accidents, but 93 percent of those fatalities occur in low- and middle- income countries where mass vehicle usage is a recent phenomenon. As manufacturers produce safer vehicles, cities improve roads and drivers become more adept, fatalities tend to decline. But Smeed’s Law only seems to hold up for people in cars – not for other road users. A global status report shows that road traffic injuries are now the single biggest cause of death for children and young adults, and that more than half of all traffic deaths are pedestrians, bicyclists and motorcyclists. In the United States, driver fatalities fell from 27,348 in 2006 to 23,611 in 2017, but pedestrian and cyclist fatalities increased from 5,567 to 6,760. Lower-density cities that are heavily car-dependent, such as Phoenix, tend to be more dangerous for pedestrians. Modern U.S. cities are designed largely for motor vehicles. At the turn of the 20th century, people and cars shared city streets, which served as places for children to play, adults to walk and neighbors to meet. From the 1900s to the early 1930s a battle was fought as motor vehicles became increasingly dominant. As traffic fatalities rose, angry mobs dragged reckless drivers from their cars, and some cities printed “murder maps” showing where people had been killed in traffic. In the 21st century, a new city ideal has emerged of a more bike-friendly, walking-oriented city. But piecemeal implementation of bike lanes, pedestrianized zones and traffic calming measures often just adds to the confusion. The bike path on King Street has drawn criticism for posing a conflict with vehicles trying to turn into businesses. All of these factors are making walking and bicycling more dangerous. While pedestrian deaths in Norway declined by 37 percent from 2010 to 2016, in the United States they increased by 39 percent. Non-driver traffic fatalities are increasing in the United States at higher rates than most other wealthy nations. Large trucks turning right are particularly dangerous for cyclists. Vision Zero, a strategy first proposed in Sweden in 1997, imagines cities with no traffic fatalities or serious injuries. At least 18 U.S. cities and states have signed on to reach that goal by 2024, including Boston, Chicago, Los Angeles, New York and Washington D.C.
Strategies vary from one city to another. Boston, for example, has reduced the city speed limit from 30 miles per hour to 25 mph. Washington D.C. is improving 36 intersections that pose threats to pedestrians and enacting more bicycle-friendly policies. These cities still have far to go, but they are moving in the right direction. John Rennie Short is a professor of the School of Public Policy at the University of Maryland, Baltimore County.